I have some straight paths with only two nodes (start and end node). They are short and I want to prolong them in the same direction that the line is. The paths are oblique-angled and not horizontal or vertical oriented. If so, I know that I could have used the Ctrl key to prolong in horizontal or vertical direction. Question: Is it possible to prolong the paths in the paths direction? Ensure that the nodes on the line do not have bezier style handles. Edit the line, and select the node at the end you want to extend. Press Ctrl+Alt and drag the node. The node will move exactly along the line, changing the length. This works because the handles of the nodes effectively point exactly towards the other end of the line, so dragging a node in the direction of its handle means it moves the node nearer or further away from the other end, exactly along the line itself. This works only if you have selected Geometric bounding box as Bounding box to use in the Inkscape preferences. 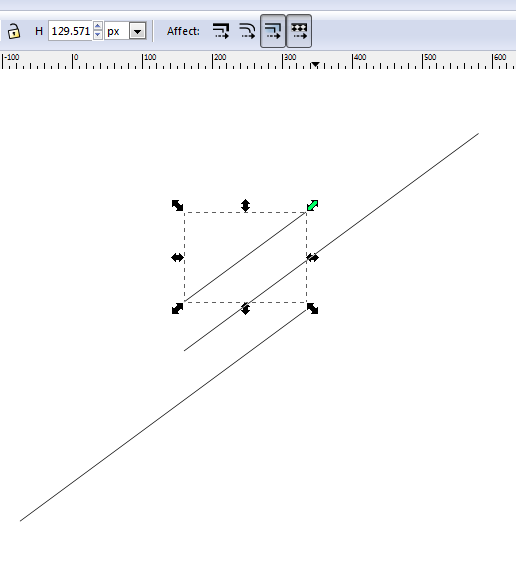 The Inkscape default Visual bounding box will change the direction of your line! Press the Ctrl key and drag the selection box corner at the end you want to extend (eg where the green arrow is shown), so as to scale the line. The line changes thichness as you drag, but snaps back when you release the mouse. Because you do a Ctrl+Scale, you get a uniform scale without distortion. Because the line width is not scaled, the result is a line that is longer than it was, but has the same line width - i.e. the exact same thing as extending the line. The snapshot below shows an original line and the effect of scaling the line in either direction. Not the answer you're looking for? Browse other questions tagged vector inkscape path or ask your own question.